Transportation and Intelligence Minister Israel Katz was set to fly Sunday to Oman at the invitation of his Omani counterpart to present a plan that could see a rail link between Israel and the Gulf. The move comes as Israel dramatically steps up its contacts with the Gulf states, despite still not yet having formal diplomatic relations. Katz was to participate in an international transportation conference in Muscat to present a regional transportation initiative, which he is advancing jointly with Prime Minister Benjamin Netanyahu, who visited the Sultanate last month. It is the first time an Israeli minister has been formally invited to participate in an international conference in Oman, reflecting the strengthening ties between the two countries. Netanuahu’s visit marked the first official meeting between the leaders of the countries since 1996. The transportation initiative, called “Tracks for Regional Peace,” is based on the planned extension of railway tracks in northern Israel, which would link Haifa’s seaport to Jordan’s rail network, which in turn will be linked with that of Saudi Arabia and other Sunni Arab states. The initiative will see the eastward extension of the Haifa-Beit She’an rail line to the Jordanian border and will also include a stop in Jenin, connecting the Palestinians to the broader plan. The initiative, which seemed overly optimistic when it was proposed last year, now seems much more realistic. Netanyahu had frequently boasted of warming behind-the-scenes ties with Arab countries. Following his visit, they have now come out into the open. In another sign of those ties, Israel’s sports minister Miri Regev was in the United Arab Emirates last week for an international judo competition, while Communications Minister Ayoub Kara attended a communications conference in Dubai last week. 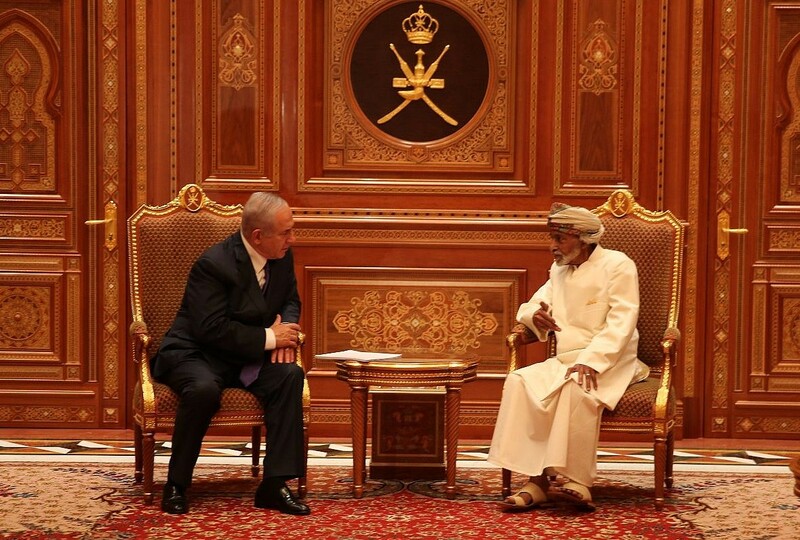 On October 26, Netanyahu’s office unexpectedly announced that he and his wife Sara had just returned from an “official diplomatic visit” to Muscat, during which they met with Sultan Qaboos bin Said.